Both of these organisms suffer from diminishing habitats as global temperatures rise and the ice melts away. Both of them are the subject of conservation science, but only one of them is the face of Conservation Funding. Can you guess which one? 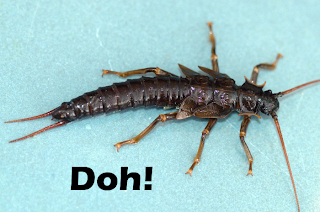 Sorry Mr. Stonefly, I guess that you hit every ugly branch on your fall along the phylogenetic tree. Maybe it's the feelers, maybe it's the glossy smooth carapace, or maybe it's the fact that that you ditch unwanted exoskeletons on rocks and rafts overnight, scarring Amy on her childhood rafting adventures. Regardless, while the noble polar bear gets funding simply by being fuzzy and well able to hide in a snowstorm, it looks like you're gonna have to go a little further to get some money to unmelt your glaciers. Sure, you're in line to be the first species listed as Endangered due to climate change, but have you considered selling your children to jewelry factories like your less-disgusting cousin the caddisfly? They seem to be doing pretty well for themselves. Big pimpin' in the L.A.K.E. 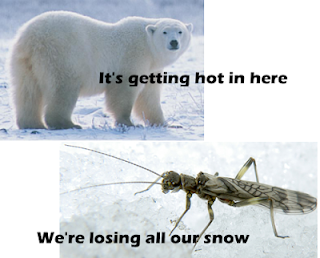 But honestly, it's not the stonefly's fault. Humans are attracted to giving money to certain things, and top on the list is not anything scaly, slimy, or otherwise crunchy. No, humans tend to appreciate forward-facing eyes, big furry halos, and impressive sizes. When a charity wants to get in on the endangered species money pool, they hit us where it's so cute it hurts, even if the animal they're using doesn't actually make a lot of sense. For example, check out the collection of stuffed animals for sale by the Canadian version of the World Wildlife Fund. Half these animals are actually not "at risk" so much as they are listed by the IUCN Redlist as being of least concern! Perhaps the WWF thinks that the oh-so-gullible Canadians will be fooled by fuzzy faces that aren't endangered; maybe Meaghan's status as a half-breed prevents her from being overwhelmed by adorableness. This phenomenon is known as using a "Flagship Species" to draw in funding. Genuine research has gone into understanding what draws funding for an animal. Being a mammal is big points in its favor, but if it's an amphibian it's gotta be weird. The conservation of the animal can't be a threat to humans in the area. Being big is a bonus: shrews and possums had better watch their disgusting little steps, because they aren't big enough to warrant public interest. A 2009 study showed that those animals with plenty of research on their conservation status recieved more funding than those without... but that research was typically skewed towards those animals that received more funding: a viciuous, self-feeding cycle that ignored the ugly and small in favor of the big and well-known. Now to be fair, many charities distribute the funds they receive amongst the less-phenotypically-fortunate organisms, but many don't. In fact, in some cases it seems as though using flagship species actually draws funding away from the organisms that need it the most, as policy is often influenced by the same factors that determine the funding flow in the first place. What makes an organism or an ecosystem worth saving is a topic for a whole series of other blog posts, but it is the Christmas season: time to donate to the less fortunate, to pay attention to the needy and the less blessed. In the Christmas spirit, Amy and Meaghan have trotted forth several visually-unfortunate animals that are in need of your help. To fund any of the following of Mother Nature's taxonomical Mod Podges, please click on the hyperlink of its name! The Aye-Aye on a good hair day. For some unknown reason, this poor creature has long been considered a poor omen in Madagascar where it is often killed on sight. Sure, it looks like the lovechild of a rabid chihuahua and an electrocuted bat with a balding patch of possum fur, and it was the inspiration for a particularly creepy episode of Primeval, but the gentle Aye-Aye is an imaginative lover (they mate upside-down!) and resourceful food gatherer! The Aye Aye has a single elongated demon finger that it uses to tap out mad beats on tree trunks and echolocate for its food! Having developed the evolutionary equivalent of a pipe-cleaner on its hand, the Aye-Aye is equally good at digging grubs out of trees, spooning out coconut guts, and flipping everyone around it the bird. Who doesn't love an animal that's physiologically forced to constantly re-enact E.T.? The Aye-Aye: The Demon's Woodpecker. The tree was shuddering in horror the whole photo shoot. The Pangolin is one of the few organisms to be entirely covered in fingernails, which when we started writing this sentence seemed like points in its favor. Um... well, it does mean that the Pangolin is officially the most cost-effective organism at a nail salon - 15$ to get its whole body painted, what a deal! And if crazy, claw-wielding ladies like Flojo can be considered beautiful, then Pangolins must be too. Excess keratin is beautiful, guys. Unlike Flojo, Pangolins are barred from the Olympics, which is a total shame because they are amazing gymnasts. Baby pangolins cling to their mothers even when Mama Pangolin decides to climb on the ceiling like the girl from the Exorcist. They're like scale-covered burrs! But when you think about amazingly talented and bendy animals you think of primates and Biscuit because despite their incredible climbing ability, pangolins are discriminated against because of their looks. Also possibly because they smell like skunks. But neither skunks nor Flojo can dig straight through cement, now can they? The Malayan Pangolin: A Fun Hybrid of Animals You Don't Like! Tastes like chicken, with a nice sprinkling of volcanic ash and mutating fungus. Since the only reason people like to fund amphibians is when they're frickin' weird, we thought we'd pick one that honestly is pretty standard. 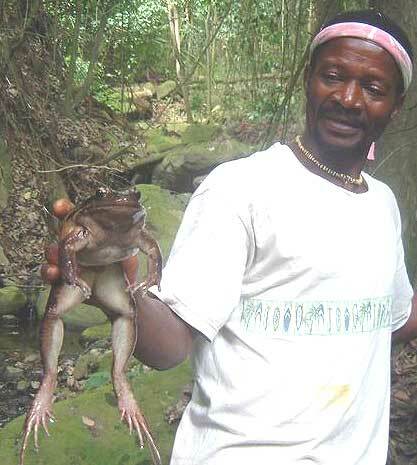 The most interesting thing about this frog is its name, which is directly related to why it's endangered: it is big and tasty. This frog suffers from a terrible middle ground: it is just delicious enough to eat, but not delicious enough to commercially breed. It also lives in the Caribbean, where its habitat is being restricted by volcanic eruptions. On top of that, this long-time native, first-time endangered frog is afflicted by the chytrid fungus which strikes the dual death blow of killing the frogs and making them even grosser to think about. Check out the legs on this one! Mmm mmm delicious. The Chicken Frog: Not Quite Tasty Enough To Save. Leader-Williams, N. "Animal Conservation, Carbon and Sustainability." Philosophical Transactions: Mathematical, Physical and Engineering Sciences, 360.1797 (2002): 1787-1806. Sitas, N, J. E Baillie, and N. J Isaac. "What Are We Saving? Developing a Standardized Approach for Conservation Action." Animal Conservation, 12.3 (2009): 231-237. Smith, Robert, Diogo Verissimo, Nicholas J.B Isaac, and Kate Jones. "Identifying Cinderella Species: Uncovering Mammals with Conservation Flagship Appeal." Conservation Letters, 5.3 (2012): 205-212.